Advanced Prevention tools use new types of technologies to reduce the attack surface and increase the ability to block exploits and malware from penetrating networks and compromising systems. They offer high efficacy without added complexity or business disruption. 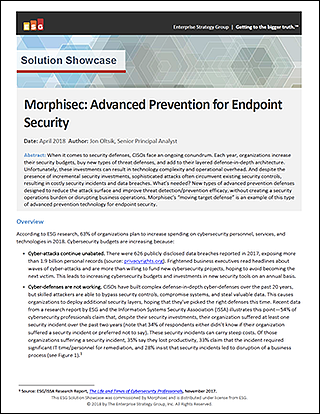 ESG found Morphisec’s solution excelled at all key Advanced Prevention Defense criteria.